Hunt Enemy Agents Before They Hunt You! 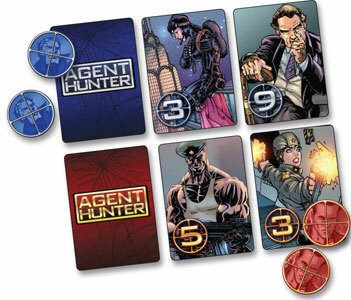 In Agent Hunter, 2 players act as rival agents attempting to eliminate their opponent’s safe houses, represented by face down cards. However, the closer you get to uncovering your target, the more you risk compromising your own position. Stealth and cunning are your greatest allies, for only agents that remain hidden in the shadows will survive the hunt. In this card game two players square off attempting to eliminate agents of an opponent. Each has 10 cards (numbered 0-9) and puts down three cards in front of them face down. Players take turns guessing the numbers of the cards and receiving information on whether the actual number is higher or lower. Three times per game cards that are about to be guessed can be taken back into the hand and a new one placed face down. This game did not engage me at all. I found it too math-focused (and I like math) with the theme pasted on. Not a lot of fun, not much excitement, just calculating probability of numbers being there. If you are looking for a similar card game I would recommend the much more engaging Love Letter. If you’re looking for a two-player game – Dungeon Roll would be an improvement over this one. Add a Review for "Agent Hunter"